My name is Gary Pugh. 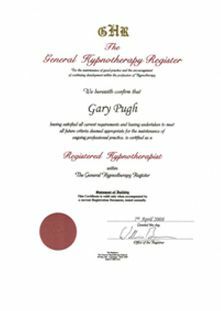 I am a GHR registered hypnotherapist and GHSC validated practitioner. I am also a qualified NLP master practitioner. 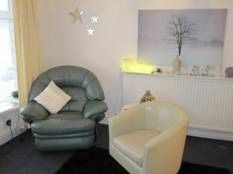 I have been practising in the fields of Hypnotherapy and NLP (Neuro Linguistic Programming) since 2007, carrying out over 2000 sessions of Hypnotherapy and/or NLP at the Horizon centre, one of the most respected complementary centres in Swansea. 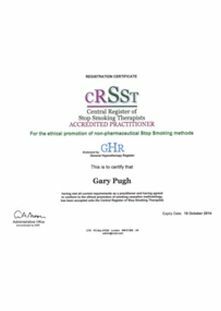 I follow a path of CPD (Continuous Professional Development) within the GHR. More than 70% of my current client base are now referrals. That means, satisfied clients referring friends or family following their successful experience. The remainder are new clients. One of the most important aspects of my profession is to establish a professional rapport with each client. It is vitally important to have a clear understanding of what a client wants or needs and what they find so limiting within their current experience. Building rapport means listening and speaking in language that is meaningful relevant and empathetic to an individual. In my experience, a successful outcome is dependent upon understanding what contributes to the clients current experience, what ideally they would like instead and what is stopping them getting what they want. Once this framework is established, it is possible using the hypnotherapy to begin to re-code the experience, by collapsing negative anchors/emotions, letting go of the past, changing limiting beliefs and by connecting to positive resources the person has available in other aspects of their current or younger life. I have built my reputation through trust, integrity and using an empathetic approach that truly respects client values. 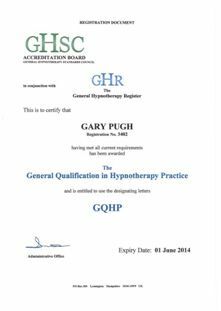 As a member of the GHR and validated by the GHSC, the UK’s largest and most prominent organisations within the field of Hypnotherapy, I follow a written code of ethical conduct. You can be assured of a confidential and caring service.